Since the introduction of the Smurfmobile into our family, we have been hearing a few Smurf-related jokes. I am being sent pictures of other Smurf-toned vehicles, and we have since decided that my dear Smurf-mobile is not truly the color of a Smurf. It is more like... well, um, the color of a Smurf that had been choked to death. Gruesome, I know, but pretty accurate. Imagine my surprise when I got a package in the mail from Brenda, my oldest friend in the world. Well, by my oldest friend I mean the friend that I have had the longest that I still keep in touch with regularly, not to imply that she's really old. Or that I never had a friend before I met her. I laughed, and laughed, and laughed. That was funny. I decided to do a color comparison to see how close the Smurfmobile was to an actual Smurf, and I had images of laying this stuff across the hood of the van and taking a picture to see. But this morning, the van looks like this. I know this is not the greatest picture, but I was going for the best picture I could take while leaning out the front door so that my feet would stay warm. Thank you, Brenda, for the great gift! I am planning on filling the bags with some fun in-the-car activities and snacks for the kids, and stash them in the stow-and-go compartments till I need them. I'm so excited! Well, I'll have to settle of this one from the early nineties. 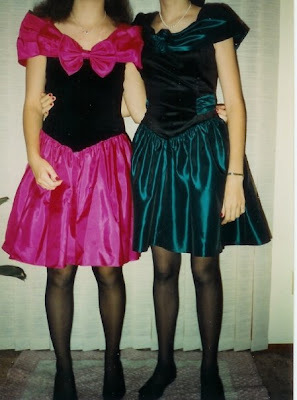 This is Brenda and me before the Homecoming dance our Sophomore or Junior year. I don't remember. We didn't intend on having almost-matching dresses, it just turned out that way. She's the one in pink, and I'm in green. No, I didn't crop the picture. This is just how it was taken. A lot of pictures in Brenda's life look like this.... But we were sure cute, weren't we? UPDATED: No, I'm not hiding anything. That truly is the real picture. Don't forget this post, where you can see my and Brenda's heads! HA! It's a perfect match! I have an "old" friend like yours from highschool. Lots of wierd pictures and inside jokes...aren't those friendships the best?! What? I wanted to see the big hair!!! That is a super picture! You are just kidding about it not having been cropped, right? You are just keeping your identity secret. I agree with Holly: where's the big hair?? Alright, just see the update at the bottom of the post! Seeing the bag "who's your papa?" again makes me laugh! Oh it was too funny when we found the stuff (Matt was with me and had a hand in choosing things!). You are most welcome for the goodies! And to everyone else reading, she is NOT lying. That picture is NOT cropped. That's my mother's fabulous photography talent. Thank goodness for digital now so she can see if she got everyone's head in a picture! And thank goodness you put the link to that other post, I'm not even going there because I KNOW what HORRID picture is waiting!!! Ok, I called Marty and he told me I HAD to read your posts...I am truly sorry for being a sucky friend who has not shared in the laughter!!! How much fun can we have at the expense of big hair... B I wonder if I can find the wallpaper my friend had when I was 8??? I can tell I will have to drag out some photos just to grab the memories! haha!! Love the bags! That's awesome!! Love the dresses. I had one just like that only in purple about that same year. It must have been the style that year. Too funny about the heads. It's so nice to have digital now.